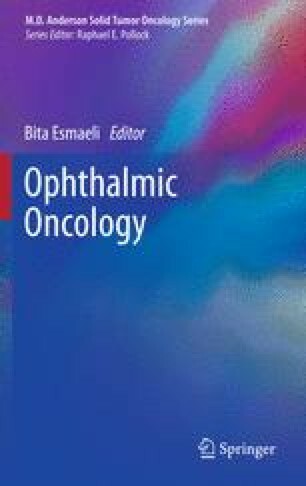 The lacrimal drainage system, which is covered by a highly proliferative epithelium, is susceptible to the side effects of chemotherapy drugs, which are secreted in tears. Docetaxel, an antineoplastic agent widely used to treat patients with advanced breast cancer as well as other malignancies, is secreted in tears almost immediately after intravenous administration and thus may cause canalicular inflammation and tear drainage obstructions. 5-Fluorouracil (5-FU), another frequently used chemotherapeutic agent, commonly causes increased lacrimation. Stenosis of the punctum and canaliculi is a less common side effect of systemic 5-FU therapy. To prevent the need for dacryocystorhinostomy or placement of permanent Pyrex glass lacrimal drainage tubes, patients undergoing treatment with docetaxel or 5-FU should be closely monitored for punctal and canalicular stenosis.